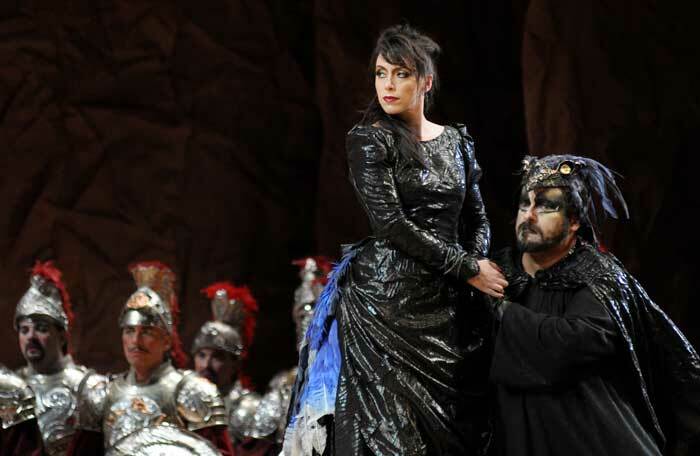 Armida is one of Rossini's most beautiful operas, a spectacular vehicle for his mistress Isabella Colbran, prima donna at Naples' San Carlo Opera House, whom he would marry a year later. 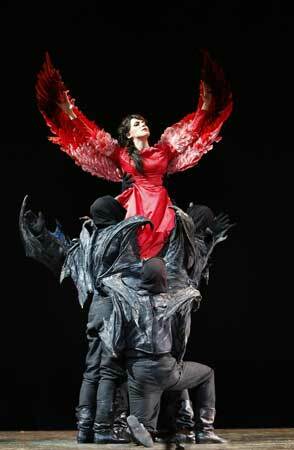 It was this year's "big" production in the Adriatic Arena at this year's Rossini Opera Festival. It is an opera which clearly privileges the prima donna. Probably the reason why Armida is seldom revived is that necessity for five (or at least three) tenors who can sing difficult bel canto vocal lines, but the real necessity for this opera is obviously a charismatic and extraordinary singer for Armada herself. (Rinaldo, the main tenor in the work, does not even get an aria of his own; the focus is musically and structurally always on Armida.) 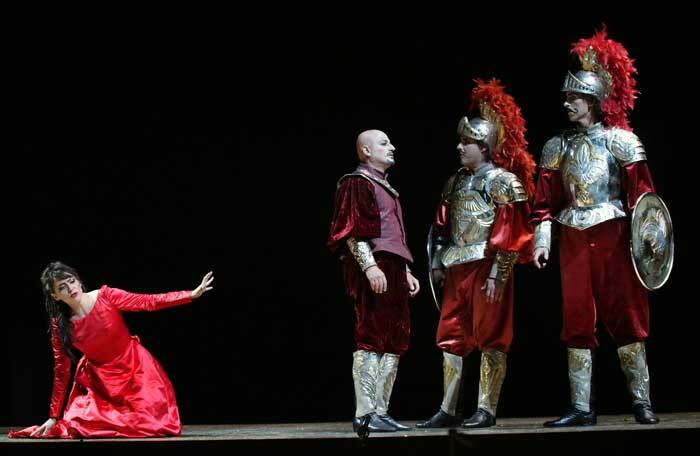 Pesaro this year did find three amazing tenors for the five tenor roles, and a competent if not extraordinary Armida. Antonio Siragusa, a Pesaro regular, brought passion and passionate singing to Rinaldo, one of those high-flying Rossini tenor roles that requires amazing agility. The Russian tenor Dimitry Korchak, also a regular at Pesaro since 2004, sang the dual roles of Gernando and Carlo (Gernando, the warrior who quarrels with Rinaldo in Act I and is killed gets a full fledged scena with aria and virtuoso cabaletta in Act I and Carlo gets a tenor duet and a tenor trio in the last act). Korchak won great applause. Randall Bills, an extremely thin young man who hails from Fresno, California, was impressive in the dual roles of Goffredo, the leader of the Crusade, in Act I, and Ubaldo in Act III. He too has an extensive solo in the first act and a tenor duet and tenor trio in the last one. He shone and was heartily applauded. The bass (also a dual role as Idraote in Act I and Astarotte in Act II) was the well know Carlo Lepore, wearing a dark costume with bat wings (he is a demon). The Armida was Carmen Romeu, a Spanish soprano who started in Pesaro as a student with the Rossini Academy in 2011 and has graduated to important roles. She did not obtain very good press for her essaying of this role, and she was booed at the curtain call the first time we heard her and booed after her most famous aria ("D'amor il dolce impero") the second time. Most assuredly, she did not deserve the boo's. Her chief problem seems to be that she is not Maria Callas, who first sang the role in a famous revival in Florence in 1952 or Renee Fleming, who sang it in Pesaro as an unknown, young soprano in 1992 (recordings of both performances exist). Romeu may not be an unparalleled singer like Callas or an exciting new find like Fleming, but she is quite competent and did more than just get through the role. Fleming tried it again, at the Met, rather late in her career, and I found her mannered and too careful in the extremely difficult coloratura. 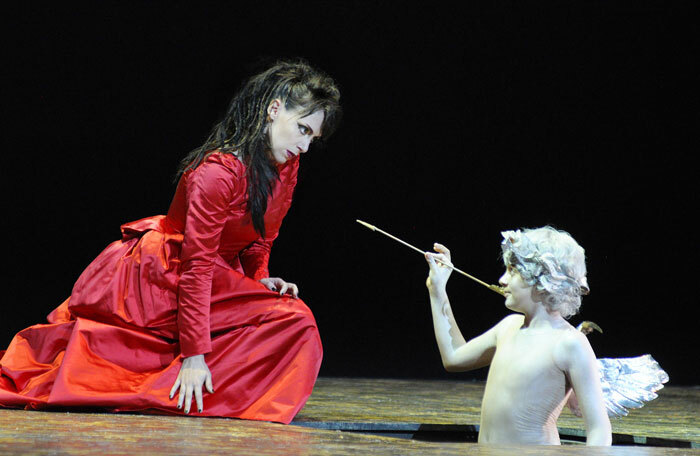 This performance, not without faults, was much more exciting than the Met's production of a few seasons ago. The superb Bologna orchestra and chorus was under the direction of Carlo Rizzi. The worst thing about the evening was the ballet, which contained some of the most awful choreography since God invented dancing. The dancers were part of a company from Milan directed by Michele Abbondanza, a collaborator of the production's director, Luca Ronconi. One could shut one's eyes and listen to the beautiful ballet music, and I did the second time around. I suppose the dancers did what they were told to do, but it looked like bad dancing at a rock concert. The production itself has been much misunderstood, at least in the English language press. The famous Italian director Luca Ronconi took his inspiration from Sicilian puppet or marionette theater, a famous tradition which is cited by UNESCO as an intangible heritage. The Sicilian puppet theatre goes back to the Middle Ages, and the marionettes illustrate chivalric stories from the Roland epics (Orlando in Italian) and specifically from Jerusalem Delivered. Thus when the curtain went up, we had two tall 'boxes' containing marionettes dressed as crusaders, and the costumes of all the warriors were in that fantastic vein; the makeup was too: splotches of rouge on the cheeks, heavy eye makeup and drawn-on beards. Costumes consisted of bright, silvery breastplates and helmets with red plumes, red pantaloons and silver leggings and a wooden toy sword--something no crusader would be caught dead with, but typical of the marionette tradition. One can see the plays today in Sicily and see the scenes painted on bright carts in Palermo. There are even two museums (or more) dedicated to this important tradition. Some of the reviews I read, not understanding the inspiration, simply found it all "cheesy." I thought it was charming. 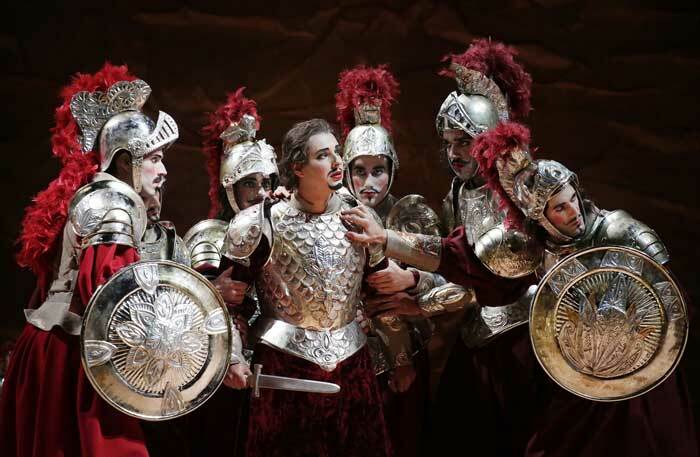 Armida has wonderful music--I think it is one of Rossini's best scores--and if this year's Pesaro production was not absolutely thrilling, it was good enough to send the audience out of the theater happy and content. The performances here, by the way, have been totally sold out. It was almost impossible to come by a last minute ticket for Armida or any of the other opera performances, a harbinger, I hope, of some good news for opera companies in the future.